Resin guru Paul Fisher of Fisher Model and Pattern has released another interesting detail set, this time targeted for Revell's still-nice 1/32 Mirage IIIE kit. You'll recall that the Mirage IIIE was the strike variant of the successfully Mirage IIIC fighter that had a slightly longer nose to accommodate more fuel and avionics. The Mirage IIIE was exported widely while the Mirage IIIO was the designation applied to the Mirage IIIE configured to the Royal Australian Air Force's standards and really differed mostly in avionics. Revell recently reissued this kit and while one of the more interesting detail sets for this kit was the TAC Scale Dynamics Kfir C7 conversion, there haven't been many options for detailing out the Mirage IIIE...until now. 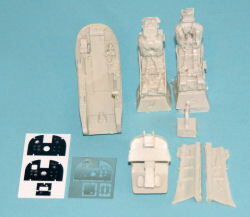 This set provides a completely new cockpit tub that features nicely detailed side consoles and rear bulkhead. The one-piece instrument panel/forward bulkhead also has the rudder pedals in place. The resin instrument panel is blank so you can select one of the two instrument panel layouts provided on the printed acetate and overlay the photo-etched instrument panel face. As the instructions describe, the Mirage III had a wide variety of panel configurations, two of which are provided here for your use. The set includes two ejection seats, the Martin Baker Mk.4 seat used during the early years of the Mirage IIIE/O; and the MB Mk.6 that was fitted later for better zero-zero ejection capabilities. Both seats have very nice detailing cast into the parts. The set wraps up with sidewalls and a replacement control column. This conversion is yet another fine example of Fisher Models' excellent craftsmanship and eye for detail. In fact, Harold Offield (AMS Resin) developed the master for the cockpit tub and the Mk.6 seat while Juan Carlos Heredia mastered the Mk.4 seat. Nice work gentlemen! My sincere thanks to Fisher Model and Pattern for this review sample!